Plan Your Vacation Month: Take Gunrock along, take a photo and send it in! Healthy UC Davis and other university units are starting the year strong with programs for staff, faculty and students on bodyweight, diabetes prevention, smoking cessation (retirees welcome), mindfulness, physical activity and overall well-being, including a Mondavi Center show and Plan Your Vacation (with Gunrock) Month! Know Your Numbers — Blood glucose screening (fasting not required); for staff, faculty and students (18 and older). Limited to 100 people, first-come, first-served. 11 a.m.-2 p.m. Wednesday, Jan. 10, foyer, Cowell Building. (The appointment-based Jan. 9 Know Your Numbers screening session is full.) Sponsored by Healthy UC Davis, and the Staff and Faculty Health and Well-Being Program. Bodyweight Bootcamp — For staff, faculty and students: Get a full body workout with zero equipment! Discover how to use your body to build strength, stamina and aerobic endurance at home or on the go, with or without a gym. For all fitness levels. Please bring a mat and/or a large towel. This is a WorkLife and Wellness Brown Bag program. No registration required — just show up! Noon-1 p.m. Thursday, Jan. 11, multipurpose room, Student Community Center. Diabetes Prevention Program — A weekly series running for six months, on ways to reduce the risk of developing diabetes. Open to qualified participants only, staff, faculty and students. Introductory session, noon-1 p.m. Tuesday, Jan. 16, 130 Hoagland Hall. Program sessions noon-1 p.m. Tuesdays, Jan. 23-June 19; the first two sessions will be in Hoagland Hall, the remaining sessions will alternate between Hoagland Hall and online. Sign up here if you are interested; the organizers will contact you with a few questions to see if you qualify. Sponsored by Healthy UC Davis, and the Staff and Faculty Health and Well-Being Program. 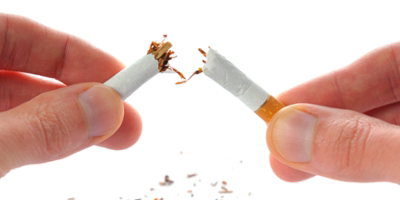 Smoking Cessation: Strategies to Quit Workshop — Quitting tobacco starts with education. Open to faculty, staff, students and retirees. Join the discussion and bring a support person. 5-7 p.m. Tuesday, Jan. 23, Hoagland Hall (room to be announced). Register by phone: 916-734‐0718. Presented by the Staff and Faculty Health and Well-Being Program in partnership with Health Management and Education. Mindfulness Awareness Practices — For staff, faculty and students: Develop a personal mindfulness meditation practice that promotes your health and well-being and helps you better manage stress. Through experiential exercises and group discussions, in a supportive community environment, the classes will prepare you to apply mindfulness in daily life. 5:15-7:15 p.m. Thursdays, Jan 25-March 8 (with the exception of March 1), on the Davis campus. Limited to 30 people chosen by lottery. More information and registration. Sponsored by Healthy UC Davis, and the Staff and Faculty Health and Well-Being Program. SToP: Stop Tobacco Program — Eight-part series — all meetings in February — focuses on empowering tobacco users to overcome the addiction. The series incorporates many aspects of smoking cessation, including behavior modification, nutrition, medications and relapse prevention. Open to students, staff, faculty and retirees. 5-7 p.m. Tuesdays and Thursdays, starting Thursday, Feb. 1, and concluding Feb. 27, Hoagland Hall (room to be announced). Register by phone: 916-734-0718. Presented by the Staff and Faculty Health and Well-Being Program in partnership with Health Management and Education. Active Aggies Mobile — Ten-week exercise and fitness classes, meeting twice a week, for staff, faculty and students. Sponsored by Healthy UC Davis, and the Staff and Faculty Health and Well-Being Program. Monday and Wednesday class — Starts Wednesday, Jan. 17, and meets every Monday and Wednesday thereafter through March 21 (with the exception of Feb. 19). Noon-1 p.m., old Scrubs Café, 150 Medical Sciences 1B (Health Sciences District). Registration required, online. Tuesday and Thursday class — Starts Tuesday, Jan. 16, and meets every Tuesday and Thursday through March 22 (with the exception of Feb. 22). Noon-1 p.m., third-floor lobby, Mondavi Center for the Performing Arts. Registration required, online. Circa’s acrobats in “Carnival of the Animals” — coming to the Mondavi Center on Jan. 28. Well-Being Ticket Deal for January — Circa Contemporary Circus: Carnival of the Animals, 3 p.m. Sunday, Jan. 28, Jackson Hall, Mondavi Center for the Performing Arts — but, to take advantage of this deal, you must buy your tickets by Jan. 14. Inspired by Camille Saint-Saëns’ beloved musical suite, the Australian company (seven acrobats, two singers and four musicians) whisks audiences away on a thrilling escapade of tumbling, flying, leaping and spinning, and delightful animations (including juggling zebras, street-smart elephants and somersaulting kangaroos). $10 ticket deal for staff and faculty, for purchases made through Jan. 14; use promo code ANIMALS18. Sponsored by the Staff and Faculty Health and Well-Being Program, and the Mondavi Center. Your vacation! Plan it, take it ... you deserve it! Gunrock: On top of the world! WorkLife and Wellness is turning National Plan for Vacation Day (Jan. 30) into a whole month, encouraging employees to suggest the topic for staff meetings, and asking supervisors and managers to fit it into agendas. “This activity encourages use of vacation time and best prepares teams for scheduling around one another to optimize coverage and productivity,” said Sandy Batchelor, WorkLife coordinator. WorkLife and Wellness has built an entire webpage devoted to the importance of taking vacations. The page also includes information on the “Gunrock Boldly Goes” campaign, inviting employees to submit their travel photos — with Gunrock in them! A miniature Gunrock, that is, to include in your photos. WorkLife and Wellness will add your photos to a slideshow on the “Plan Your Vacation” page. Send your photos by email. 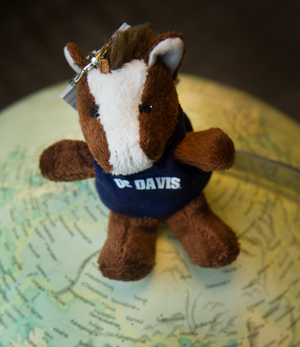 Gunrocks like the one pictured above are available at UC Davis Stores (Memorial Union, Welcome Center and Downtown Store) for $9.99 — or, pick one up for 25 percent off during the Aggie Pride Sale on Friday, Feb. 2.